A couple of weeks ago, I wrote about the use of style sheets to help you keep your writing consistent. The next step is a style guide. A style sheet is short (usually only one page) and lists very specific items, such as preferred spellings of particular words. 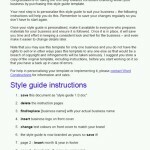 A style guide is a comprehensive set of rules to keep everything consistent. A full style guide can list the logo colours, spelling style, formatting, design and more, and would include everything in the style sheet as well. Often, a style sheet is a summary of frequently used details from the style guide. A style sheet can be on your desk or wall as a quick reference you can refer to as you work. So it is great for everyday items. A style guide is important to maintain your brand. It can be used by your suppliers as well as by staff to ensure that everyone uses the same rules to keep consistency regardless of who does the work. If you are a sole trader, you may not think a style guide is worth the effort as you control everything. But as your business grows or if you leave someone else in charge when you take a break, a style guide can keep your control in place. It can also be a very useful tool to offer potential buyers if you later to choose to sell your business. For a professional appearance, a style sheet is a great start, but I would recommend a style guide as something to aim for over time. I hope you find it useful when you visit.